I arrived in Vancouver on December 3rd. I’m here to learn English. I have stayed here for over a month. I think that this city is very beautiful, because there are a lot of stunning places that are peaceful and filled with nature. So I love it. My homestay is good too. However, I was little disappointed, because my family has a baby. Before I came to Vancouver, I didn’t know that they were about to have a baby. Sometimes, I have to wake up because the baby is crying and being noisy. At first, it was very stressful, but now I’m okay. I love my school, my classmates and my teachers. Actually, I was worried about only using English, even during the class. I think I can’t speak English well. But every teacher gave me the courage, and I think that that’s why I am here. 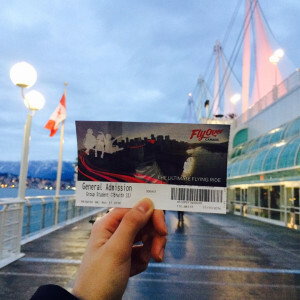 You have to go to CANADA PLACE, and you should do FLY OVER! It’s amazing and you will realize that Canada is such a beautiful country. I really liked it and I will try it again. You also must go to the Rocky Mountains. I didn’t go there yet, but I will go to the Rockies in March with my boyfriend!